Microsoft Azure is partnering with smart retail to help benefit retail chains with real time connected data to be more efficient with overall better employee and customer interactions. Retail corporations are now investing in smart retail to help lower costs of having brick and mortar store fronts by managing climate control, lighting, and inventory. This will enable stores to create a new interactive customer experience for purchases. These benefits will help with future expansion of IoT in retail companies selling products and services to the consumer. 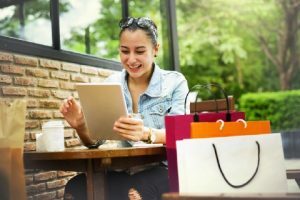 The consumer will have more information on the store front shelves enabling a more educated decision to purchase or provide impulses to the brain to spend. Azure will work with Office 365 to relay the analyzed data sent to the Cloud for adjustments on the front end with both employees and consumers to improve selling and buying ability. Currently Microsoft Azure is being integrated into retail industry to help companies get better data management and uses. IoT food services reduce operating cost by giving real time data of inventory and maintenance in vending machines. The machines are connected to the Cloud for efficiency in making sure machines are well stocked to capture accurate data. Once the data is sent to the Cloud for analytical purposes, companies can incorporate new data like weather patterns having an effect on inventory or seasonal adjustments that need to be accurate. This will create overall improvement to operations and sending back data on human behavior for consumption. IoT retail markets and stores are now able to track customer behavior with video recognition and detailed data from gender to the age of the customer. This will enable better product placement and merchandising for a more improved in-store experience. Copp Italia, a supermarket in Italy, is using this technology right now and optimized operations for customer’s preference by using interactive signage and push live notifications to consumer’s phones for instant buying affect. Microsoft Kinect has sensors and displays to track shopper’s behaviors and then uploaded to Azure Cloud for BI analytics and storage. This data will be compounded overtime and Azure will continue to create new uses for the data. Azure is positioning itself to be the largest storage facility and strongest analytical AI for retail chains and food services to expand globally. Microsoft 365 is being used with Azure to create a more efficient work place for employees by creating devices to relay everyday tasks. Avalve will work with Azure to create real time inventory management in retail. Most importantly, Azure will be able to connect and work with any device in the world to track and report data to help improve marketing to consumers with IoT.